©Neil Turner/TSL. 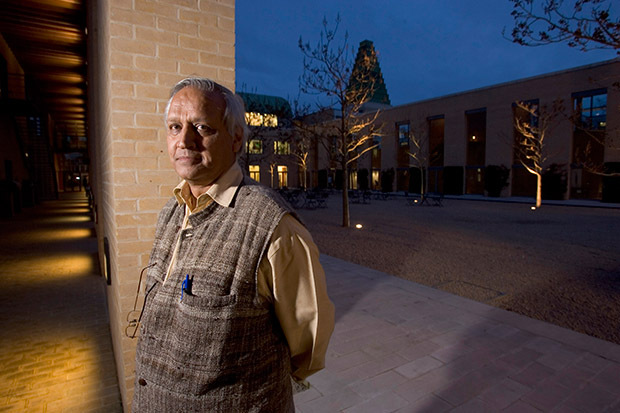 Sanjit Bunker Roy – founder of The Barefoot College in his native Rajasthan in 1984 is also heavily involved in the Global Rainwater Harvesting Organisation. Photographed at the Said Business Centre at Oxford University . Whilst looking for an image to demonstrate a specific point to a group of NCTJ Photojournalism students I re-discovered this portrait of a charming businessman and philanthropist that I shot back in March 2006 for The Times Higher Education Supplement. The point that I was making was actually about histograms but I wanted to say a little more here about why I liked this picture so much at the time I shot it. Firstly, he was a really nice man who gave me the time to shoot a small range of images. He was happy to chat, happy to be directed and trusted me to do my job. You would think that the majority of people would react the same way when being photographed by a professional but that is sadly not how it is. I was delighted that, despite being a businessman, he was wearing something a lot more interesting than a grey or navy suit. I got the distinct impression that he had cultivated an image and that he was very happy with it. My second point is the degree to which I had to mix ambient light, the sky and my own flash. I couldn’t do too much to balance the sky and the lighting around the quadrangle but I had to get the balance between the subject and the ambient just right and I ended up allowing the walkway to the left of the frame go a lot darker than I’d originally intended so that the depth of the blue in the sky was exactly as I’d wanted it. Looking back, I was always keen to see the lighting balance on the screen on the camera and I often shot two versions of a picture with differing balances so that I could choose when looking at it on a decent sized screen in the edit. These days, the screens on cameras are so much better and you get a far better impression of how the photograph will look on the LCD. My third and final point about this portrait is the way that it applies the old “rule of thirds” in an unusual way. Yes he is almost exactly one third of the way into the frame from the left (classic composition) but his body is facing out of the frame (not classic composition) and everything on the right hand side of the frame isn’t much more than decorative. I think that the light, the tones and the colours all add up to an interesting and very usable portrait – one that I remember enjoying taking. I also remember the speed with which I had to offload the images over a slightly dodgy GPRS mobile connection. But what about the histogram? The students who were at the lecture would tell you that I spent a lot of time comparing good, bad and ugly histograms and explaining what they all meant before admitting that I rarely, if ever, look at them myself! I know that in certain circles that would be a heretical thing to admit but all photographers have to have some sort of rebellion in them. Techie stuff: Canon EOS1D MkII, Canon 16-35 f2.8L lens at 16mm, ½ second at f8 on ISO 200 with a Lumedyne Signature series flash with no light modifier. Canon CR2 RAW file converted using Adobe Photoshop.